Mr. Felix Kutsanedzie, the lead author of this book, is a Senior Research Fellow / lecturer and currently the Head of the Accra Polytechnic Research and Innovations Centre. He holds a MSc. degree in Bio-Engineering; a BSc. (Agric-Mech); and an Adv. Dip. (Project Management). He is an Associate Editor of Directory Open Access Journals (DOAJ) and a prolific writer with several peer-reviewed publications to his credit. Professor Sylvester Achio is currently the Rector of Accra Polytechnic and a professor at the Department of Science Laboratory Technology of Accra Polytechnic, who holds MSc. Hons. (Research) Agric (Agronomy), PGC Ed. (Russian Language), PhD. Bio. Sci. (Microbiology). He has authored several technical books and also has presented papers at many national and international conferences, workshops, seminars as well as several peer-reviewed journal publications to his credit. Mr. Edmund Ameko is a Senior Lecturer at the Department of Science Laboratory Technology of Accra Polytechnic. He holds a BSc. in Biochemistry and a MSc. degree in Food Science and Technology, and currently the Dean of School of Applied Sciences at Accra Polytechnic. He is a prolific writer with several peer-reviewed publications. Measurements, sampling and data analysis remain a very crucial if not the fulcrum of research activities. There is not research study for which measurement and analysis are not done. For every research study to be undertaken, the researcher must have a concept for which he or she needs to find a way of measuring. However, concepts are vague ideas and thus must be reduced to variables for them to be measured. It is thus only variables that can be measured for data to be collected as empirical evidence to support a research study being conducted. 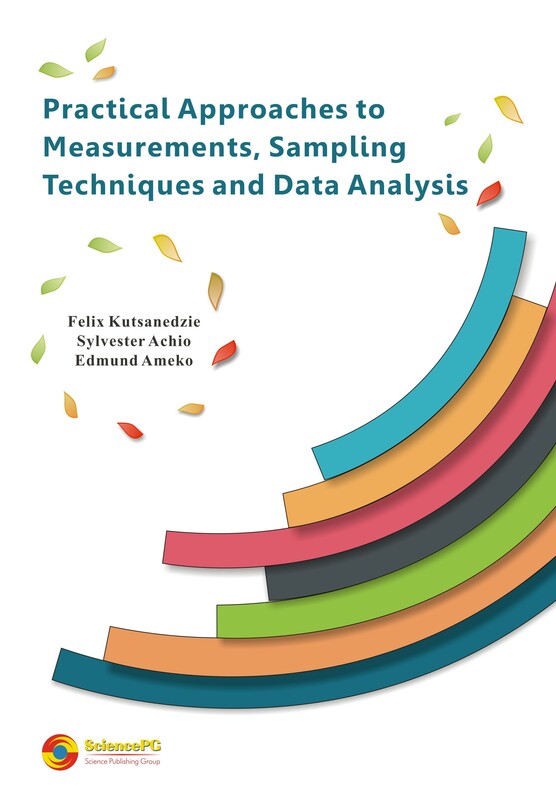 It is a complete book with several book chapters vital to understanding research through measurements, sampling and its techniques, data transformation and data analysis in a practical and comprehensive way. The book is intended to equipped lecturers, researchers, tertiary students and all those interested in researches with the appropriate skills and know-how in the conduct and appreciation herculean tasks of a researcher. It would be of immense benefit to final year tertiary students conducting their research and writing of their research reports.